The elite light fawn half Accoyo male has consistently proven himself in the show ring winning ribbons both as juvenile and an adult. His offspring have likewise been dominant possessing their sire's incredible fiber and presence. This past season he even manged to replicate himself in black (CCNF Tsunami). She is a beautifully proportioned Peruvian import with high luster. Although she is white, she produces color when bred to color. Her fleece is fine and uniform with a great degree of luster, a trait that she passes onto her offspring. 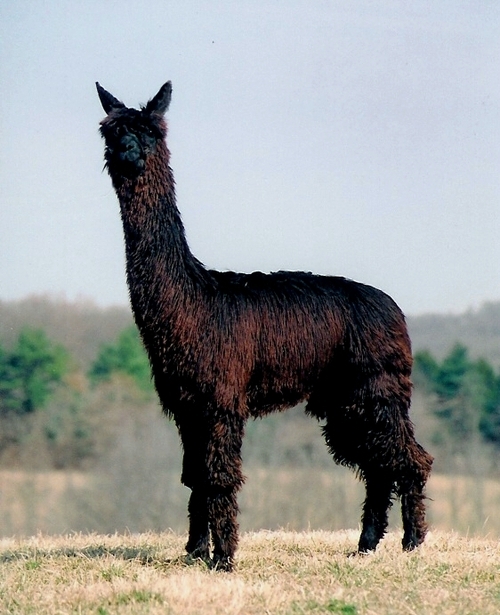 Mirage has rare genetics, going back to 4Peruvian Sargento, who only sired 4 crias due to an untimely demise from pneumonia. Three of them were shown and all were champions, Mirage, included. 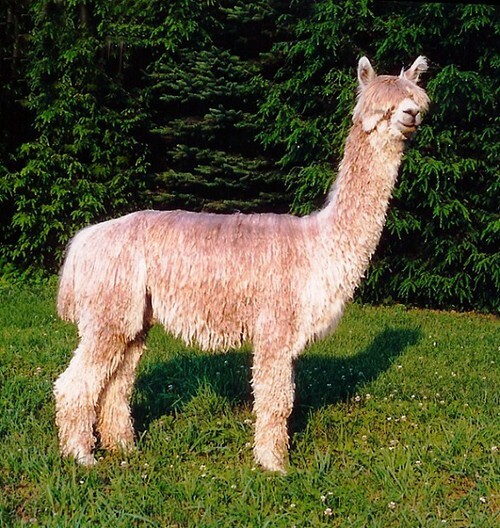 Her sire, WRSR Peruvian Maelstrom was both Color Champion and Age Champions in the 2000 AOBA National Show, and was later sold for $50,000 at auction 2 weeks after 9/11. 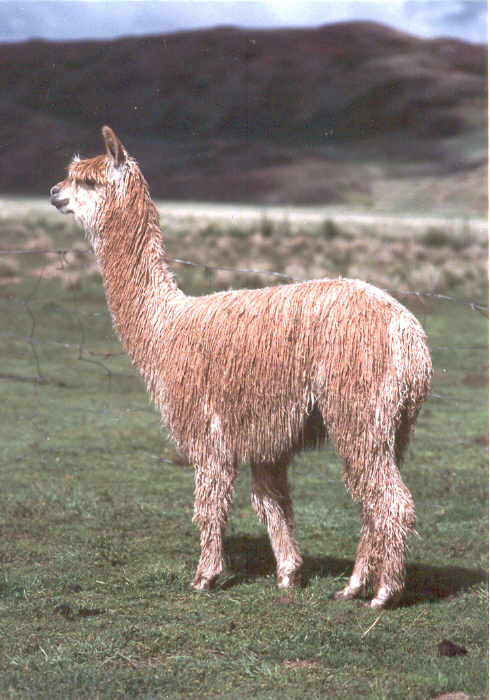 Mirage has a beautiful slick, high luster fleece, characteristic of her sire. 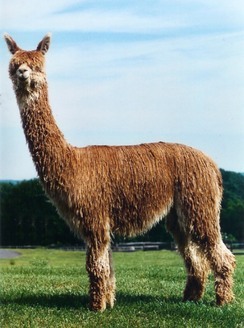 She has produced beautiful crias that are fine fleeced and high luster. Mirage, herself is a 2X Champion winning at the AOBA National Show and the Kentucky Classic. She has placed in the top 2 positions in every class she has been entered! Mirage has produced 6 beautiful crias ranging from white to bay black, all with extreme high luster, great locking, and a cool, slick fleece. 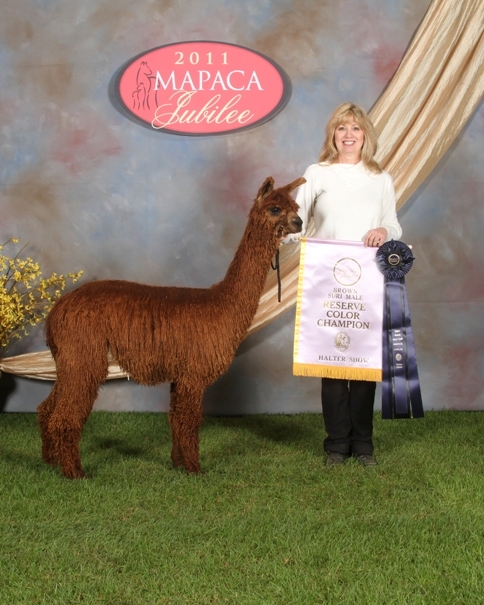 Her crias when shown have done well, including a Reserve Championship with Bazooka Jim. When bred to white, she produces white, but when bred with dark colors, she produces dark colors. We have learned the hard way, though, that she is sensitive to CDT vaccinations during pregnancy, causing her to abort 2 crias. She has no problem carrying to full term when her CDT is given prior to breeding and NOT during the pregnancy. 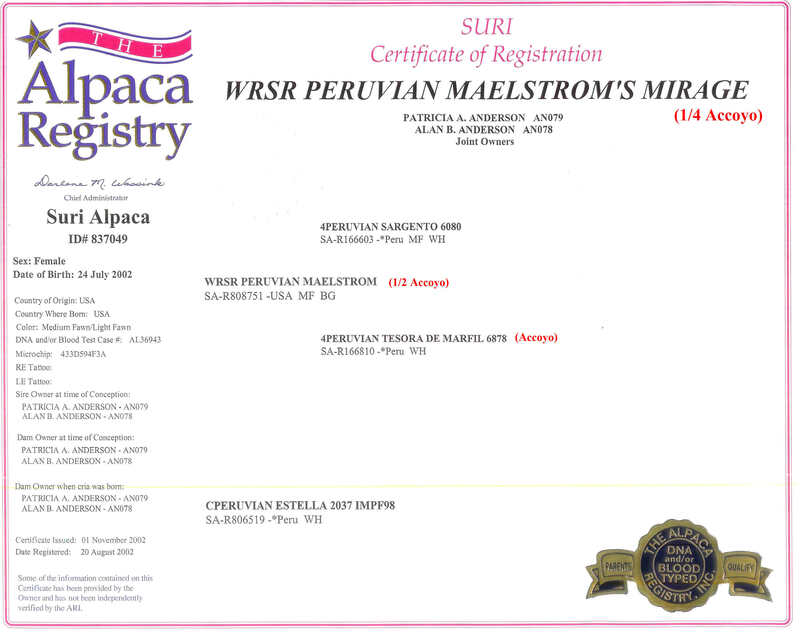 Mirage's 2014 cria was by WRSR Justice by Apocalypse, our 1/2 Accoyo herd sire out of dark brown Peruvian Dejavue. She delivered a healthy, high luster boy on 8/1/14 that is medium fawn in color. She is currently open and ready to breed for a 2016 high luster cria. She gets pregnant usually on the 1st breeding, and has a nice personality when pregnant, making her easy to handle. This is a great opportunity to add a top foundation dam to your herd! Mirage ishealthy and ccan produce 2-3 more potentially champion crias. 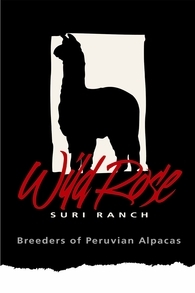 She can be bred to any Wild Rose Suri Ranch herd sire to produce a wide range of colors and fine fleece in her offspring. Contact us to schedule a visit and obtain more information.